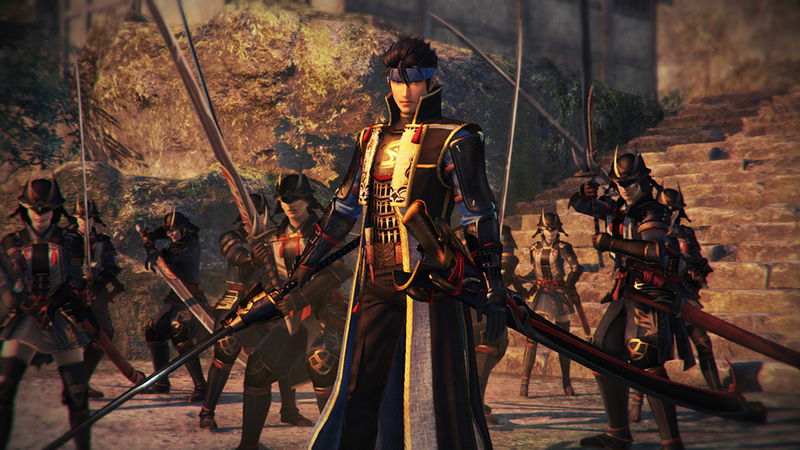 To me, Toukiden 1 was a brilliant but flawed game. Here was something I really wanted from the genre: a story-driven experience utilizing the Monster Hunter formula. On the other hand, it fell too deep into the hole of repetition and didn’t go far enough to differentiate itself. 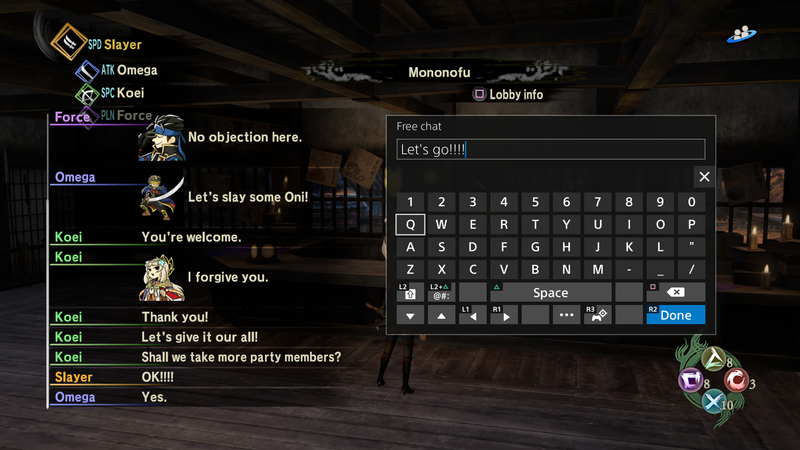 The enhanced re-release Toukiden Kiwami rapidly expanded on the formula and provided a far greater amount of everything - storytelling, Oni, Mitama, equipment, and more. I had a better time with it due to the way it tried to fill in all the empty spaces that left the previous version a fairly hollow adventure. I still use it as a solid suggestion for anyone looking to get into the “Monster Hunter” style of game due to its user friendliness and intriguing plot mechanics. 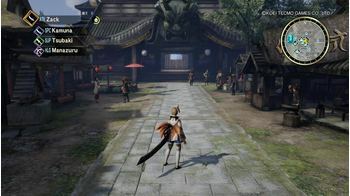 Toukiden 2 looks to do something the Monster Hunter series has yet to do (outside of its Frontier, but I’m not counting that) - go open world. While the original entry was based around a single hub, developer Omega Force went on an ambitious effort to rapidly expand the scope of the game to make it far more dynamic in nature. Was it able to accomplish all the things it set out to do? Right off the bat, Toukiden 2 throws you right into the action as one of the special units fighting to protect the Yokohama port that is under attack from the intimidating Oni. It’s a great way to show the immediacy of danger the world is dealing with while also teaching many of the important systems of the game. There’s no time to play around - you have a job to do. After being spirited away by the Oni following a battle with a giant beast, you wake up in Mahoroba Village, having been saved from a passing professor and her machina partner who found you in the forest. Ten years have passed since the time the Oni first appeared in Yokohama, destroying most of the world along with them. This event is what mankind calls “the Awakening,” and marked the first encounter with these demons who attempted to advance from the north. After a brief exchange, you soon realize you are suffering from amnesia of the events prior to the conflict. It turns out the player was dragged through an Oni Gate, a hole in space which takes its victims to a different era in history. This was alluded to in previous games when stories were told how the Oni don’t follow the concept of time and are able to freely travel between the past, present, and future. It soon turns out that you aren’t supposed to be in this period, and a certain power is out there trying to correct the situation. This curse means the player is constantly at risk of being sent back through time once more - not exactly a comfortable spot to be in. From here on, every waking moment is spent attempting to look for links to the past while slowly working to recover each memory. 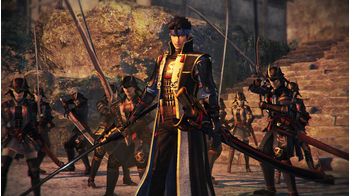 The player aligns themselves with the Slayers, an organization of warriors who act as a controlling body after the Meiji Government collapsed thanks to the Oni. They’re tasked with protecting all that remains of humanity in the Midlands region. There are two other factions that control Mahoroba Village. The people who were already living inside the village before the period the Oni appeared are led by the Guards, whereas the refugees are led by the Samurai. It’s a power struggle you become involved with that plays a pivotal role in the narrative. It appears that the only way to avoid being sent through time again is to develop stronger connections in the current period. 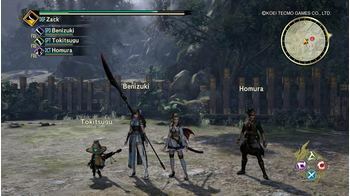 The game incorporates this story element by allowing you to forge friendly bonds with the important characters of the game, whether through conversation or by bringing them along into battle. 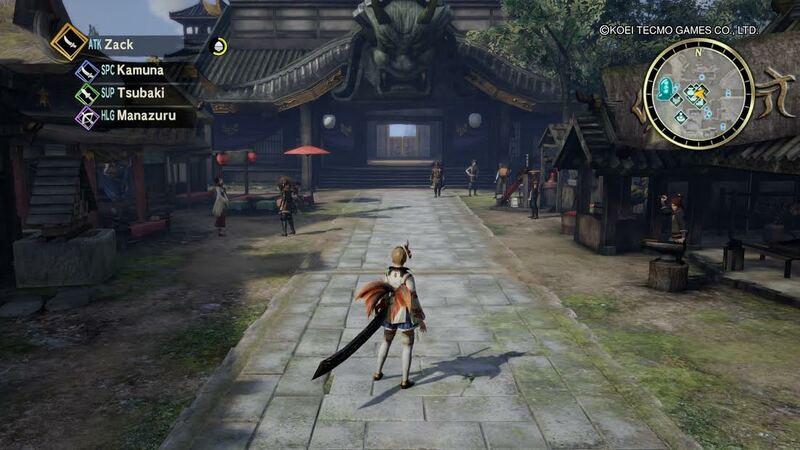 Once again, this was a feature of Toukiden 1, but is markedly more significant here due to the high stakes involved. This little oasis of civilization is far more expansive than Utakata Village. There are plenty of space to roam around in and many NPCs to converse with. There’s even a giant shrine and a large laboratory just waiting to be visited. It immediately placed the newfound level of scale into perspective. Although most of the properties in the town can’t be entered, it still felt grandiose. 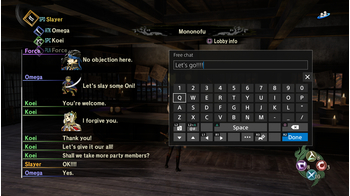 Just as before, at certain moments of the game you are able to contribute a line or two to the conversation. This holds no bearing over the direction of the story and is simply there to add some flavor to the dialog. It would be nice if some of this was voiced as you do get to choose an action during the character creation process. Instead, much like the original Toukiden or God Eater, this voice is only heard in combat. 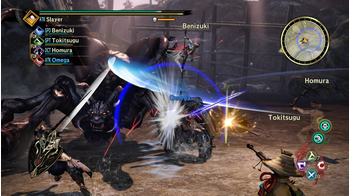 Anyone who has played Toukiden 1 will feel right at home with the nearly-identical combat system. There are several different weapon types to choose from: sword, dual blades, spear, gauntlets, chain and sickle, bow, club, naginata, rifle, chain whip, and the sword and shield. The final two options, the chain whip and the sword and shield, are new to this sequel. The chain whip is exactly how it sounds, and provides a quick way to attack enemies at a distance. The sword and shield is nice, balanced solution to combat but takes some getting used to. Along the way, you will recruit new party members (up to 3) that can join you in battle. You have some control over them; you’ll be able to order them to attack, aid others, roam freely, or follow closely. Mitama are guardian spirits based on popular figures in Japan’s history, such as Nobunaga Oda and Hideyoshi Toyotomi, that have been eaten by the Oni. You are able to equip up to four Mitama and map them to each of the four face buttons on the controller. By having them equipped as you head into battle, you will slowly be able to unlock new Boosts, or buffs to your party that are obtained by performing the Ritual of Purification (holding down a button after an Oni is dead to gather what it dropped). 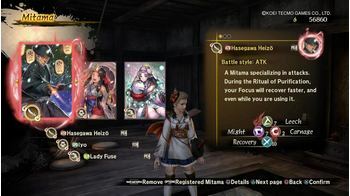 There are even special Boosts made available by equipping Mitama that shared a strong relationship during their own lifetimes. Every one of them carries with it an inherent benefit, like allowing you leech health off enemies, increasing your attack damage, and allowing for more precise attacks on body parts. You are limited by the number of times they can be summoned in battle, but there are shrines found in outposts scattered around the map that can be used to restore their stock. Once again, this is pretty much identical to how it was before. A new feature of combat is the Demon Hand, little devices placed on the dorsal side of your hand. By calling upon its power, a spiritual hand materializes in reality and delivers a variety of benefits. 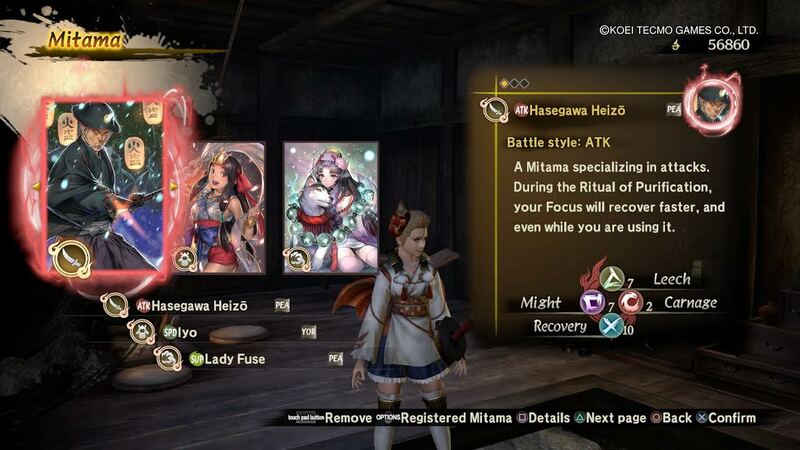 They appear to tie in directly towards whatever Mitama you have equipped, helping to bring out their full power potential. For example, one of the spirits provide an Evasion Skill that summons a explosive doppelganger for a short period of time. The way the game implements its open world nature is evident early on. As you approach the main doors of the village, they proceed to open up and you are free to roam around the world as you please, speaking to roaming NPCs, taking on side quests and joint operations, and fighting the different Oni you come across. There is also a day/night cycle that affects the difficulty of the enemies. Portal stones will allow you to fast travel across the environment to ones you’ve visited previously. The world map is gigantic, and while there’s little in the way of climbing around the environment, there’s a ton of areas to explore with distinct geographical traits. There are also different items to find around the world, from material gathering points to hidden treasures. The problem is, the game lacks a lot of meaningful open-world content. Sure, you'll come across quests that pop up as the story progresses, but these tend to be few and far between. The game could have also used some more small Oni enemy variety - you'll be fighting many of the same breeds for a good portion of the game until it opens up two-thirds of the way in. Eventually, you’ll get your own pet machina you can send out to gather materials in your stead to make the traversing a little bit easier. You’ll even be able to make your own materials to take some of the edge off the grinding. The graphics of the game won’t be winning any awards. Textures look flat up close, broken up by the sparse vegetation sprouting up. While there are certainly better-looking games out there, it gets the job done. It creates the right atmosphere they were looking for, and is definitely more impressive than anything Omega Force has managed to this point. That, and I didn’t experience any real performance issues despite the open world. Compared to the world textures, the character models themselves are excellent. There are many different weapons and armor sets to collect, each with a distinct look does its best to make you look like a badass (for the most part). The only downside here is their mouths don’t move when they talk, making them come off as nearly doll-like. I’m always pleasantly surprised by the amount of creativity Omega Force puts into the aesthetics of their equipment, which provides a strong motivation to head out and collect those other Oni parts for a new set. The character creation system is also fairly robust - both male and female avatars have 73 different hair styles alone. Hidari’s character illustrations are downright beautiful, and has quickly become one of the main draws for me to this series. It practically defines the look of Toukiden with its use of soft and subdued color palettes that just captures my full attention the moment a portrait appears on screen. She clearly puts a lot of work into her craft and has helped make the art of Toukiden 2 perhaps its most memorable attribute. I simply wished there was far more of it - many of the NPCs share the exact same character designs, only wearing different garb. But hey, the story characters look great, so I can’t find a lot to fault there. The music is no slouch, either. It does a great job at complementing every moment, from the relative calmness that piano music brings to a walk around town, to the energy of battle with its thundering drums and sharp string instruments carrying you along for the ride. I wouldn’t say it’s always memorable, but it does well at pulling you into the experience. I would like to note that this game only features Japanese voice acting with English subs - there is no localized dub to be found. But for what it’s worth, the acting is all done exceptionally well. I had a hard time finding a voice I took issue with; in fact, I felt the cast is far better here than it was in Kiwami. Adversely, the localizers decided not to include English subtitles for the random chatter that happens around the map (outside of special scenes), and it would have been nice to know what my party members were talking about. 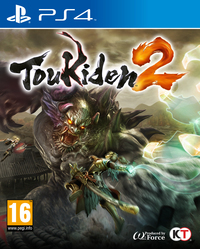 Pound for pound, Toukiden 2 is an impressive entry. The majority of the cast are legitimately interesting for one reason or another, complemented by Hidari’s wonderful artwork. It’s assisted by a wealth of content to delve into and a generous amount of equipment to procure. Yes, it may not always be meaningful, but fans will appreciate what the game presents. 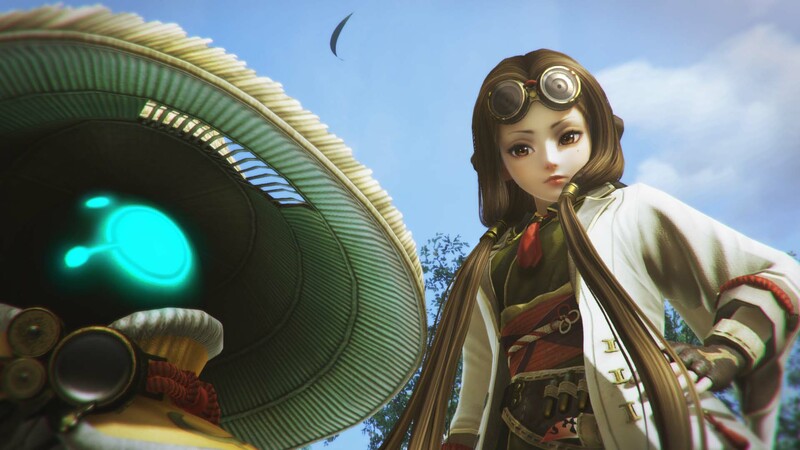 While it may not go far enough to vastly improve on its previous entry, this series continues to offer plenty of appeal for someone like me who could not get into Monster Hunter due to how it skimps on the story. 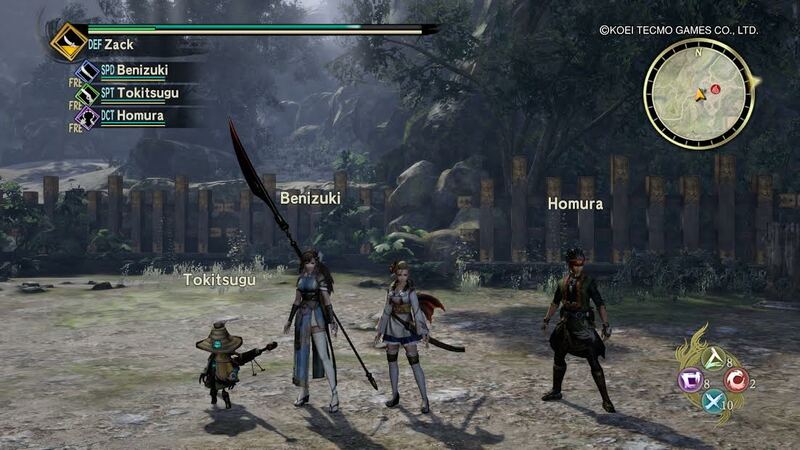 Bottom line, Toukiden 2 is a great option for those looking to get into this type of genre. It doesn't even feel as much of a chore this time to take down an Oni. And really, considering Monster Hunter hasn't been on consoles in a very long time (not counting the online-only game), it's certainly worth a look for that alone. Disclaimer: A copy of this game was provided to RPG Site by the publisher.